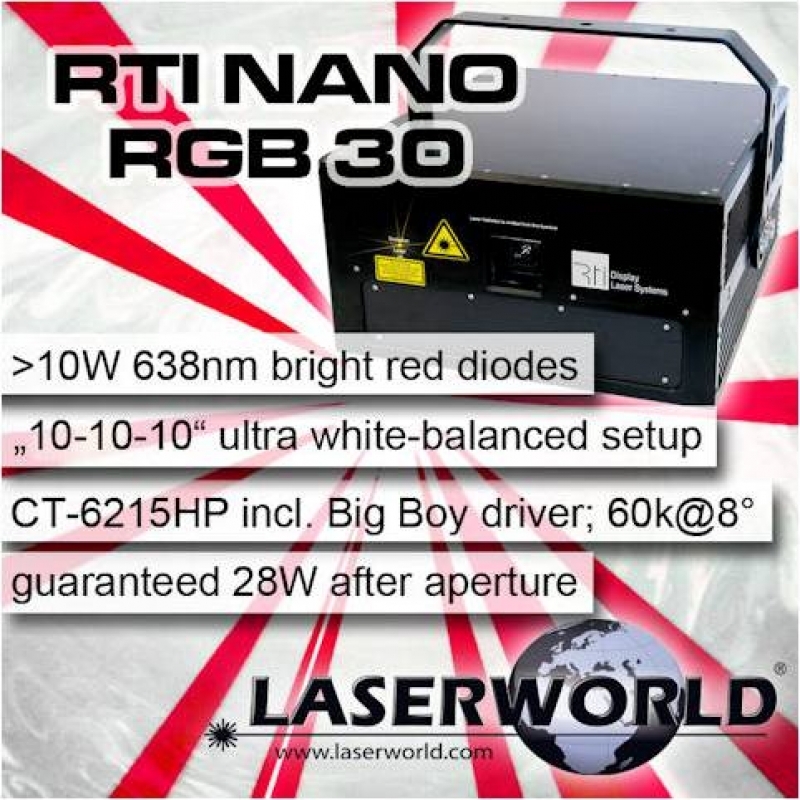 The new released RTI NANO RGB 30 show laser light systems were especially developed for professional users with high demands. 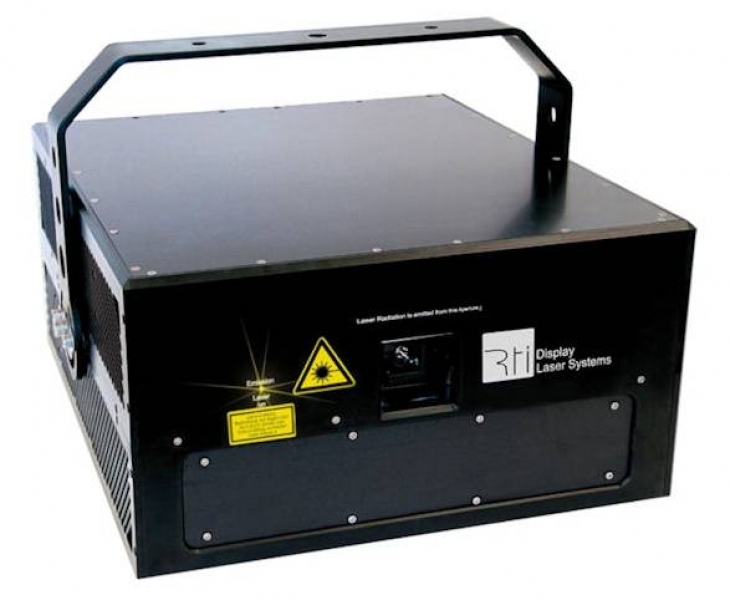 The new released RTI NANO RGB 30 show laser light systems were especially developed for professional users with high demands that require professional quality without compromise. This new system comes with a “10-10-10" setup, meaning it has nearly an equal power distribution over the color sources: >10W/638nm, >10W/530nm, >10.4W/450nm and a guaranteed power of 28W after aperture providing an awesome white balance with incredibly good beam specifications of only ca. 6mm/<1.0mrad (full angle!). The red spectrum is covered by 638nm bright red diodes only – no dark 658nm diodes are used! As a green color source, a Coherent Taipan OPSL is integrated. The major challenge was combining the huge number of single red diodes in an array with good beam specifications to be able to use small scanner mirrors for reduced inertia and therefore good scanning results. The new RTI NANO RGB 30 has such a great beam profile that the laser system can use the CT-6215HP scanners, which are driven by the original CT Big Boy drivers. Thus a scanner performance of 60kpps@8° and a maximum scan angle of 80° is possible – with still having a scan speed of 30kpps@80°! Of course the RTI NANO RGB 30 comes in the durable NANO housing, which is IP 65 waterproof and comes with the detachable remote control touch pad. 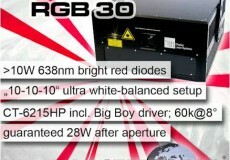 Like all RTI products, the NANO RGB 30 comes with 2 years warranty.